Scomis are able to provide remote support to customer using various methods. We can remotely support your hosted SIMS session by simply asking the user to allow us to share their session without the need of any additional software. This allows us to view your hosted SIMS session only and not your local PC or server. If we need to set up a remote session to view your workstation or server, we typically use CentraStage or GoToAssist. GoToAssist – Click here to start a GoToAssist remote support session and enter the code given to you by Scomis. 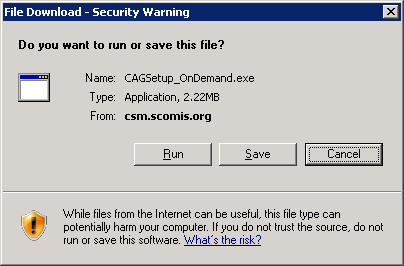 Scomis Remote Support OnDemand Agent – The Agent will automatically be removed from the computer when the computer is rebooted or when the agent is closed. When prompted with the Save or Run dialog box, click the Run option. Once the program has been downloaded, your Internet browser may display a warning. Choose the Run option. After a short period the OnDemand Agent will begin to install. The installation is complete once the CentraStage Icon is displaying in the notification area (by the clock). The Icon should have a white background with a blue sideways S.
Posted in Remote Support and tagged CentraStage, OnDemand, remote support.